The Chinese Academy of Sciences' Institutes for Science and Development and Sydney's University of New South Wales have launched a new partnership aimed at strengthening collaboration in scientific research between China and Australia. The first China-Australia Innovation Summit, held in Beijing on Monday, marked the start of the new tie-up, which includes Springer Nature, an academic publishing house. Ian Jacobs, president and vice-chancellor of UNSW, said the partnership is the largest between an Australian university and the institutes. "The addition of Springer Nature will significantly enhance the partnership with the opportunity to provide services to the research community to ensure research is accessible, available, understood and shared, so that it may lead to new discoveries." The institute has been one of the university's largest global research collaborators since the two established a partnership in 2009. This new agreement aims to solidify UNSW's links with China and create research opportunities by combining expertise and knowledge from the two academic institutions with the resources and credibility of Springer Nature. 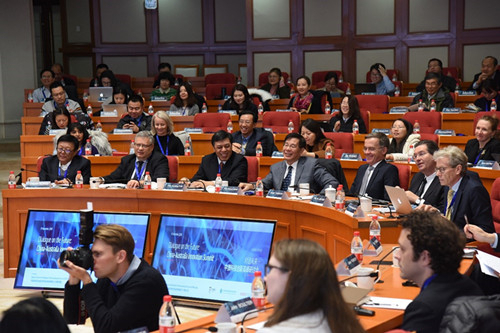 The annual summit, with China and Australia rotating as hosts, provides a platform for researchers from both countries to discuss innovation, interdisciplinary challenges, and science and economic policy. The ultimate objective is to produce recommendations for policymakers on both sides. The inaugural event focused on energy, global health, artificial intelligence and next-generation material. Pan Jiaofeng, president of the Institutes for Science and Development, said the collaboration will build a solid foundation for Sino-Australian joint research activities. "By pooling together an elite talent pool, the institutes and UNSW will build an advanced international strategy and policy research network to address major issues facing China, Australia and the world," he said.